Learn how to use Lightroom to quickly enhance a picture, use Adobe Fix to make your products pop and finally use Adobe Spark Post to create a social ad in minutes. See how you can take a product photo and turn it into a social ad for your business in minutes using Lightroom, Photoshop Fix and Adobe Spark Post. Open Lightroom on your device. 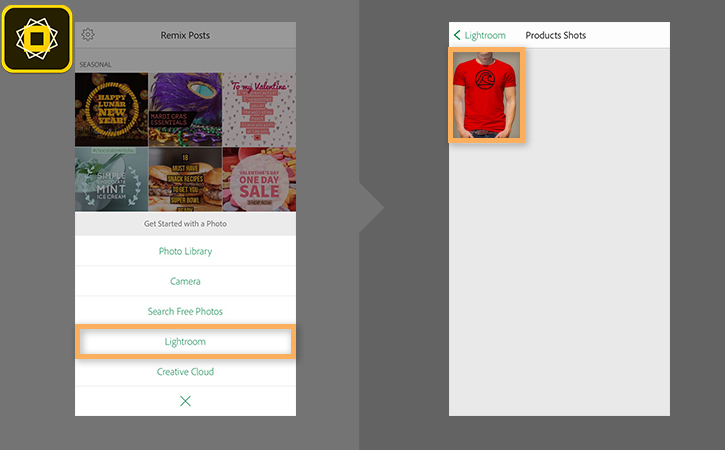 Find an image from one of your collections in Lightroom of a product you want to promote. Tap the Options icon at the bottom of the screen. Then tap Presets, and choose Color. Select the Punch 3 preset to make your colors stand out. Tip: You can also use an image from Camera Roll. Now that you have the product photo looking right, you can use Photoshop Fix to remove any unwanted elements from the shot. In Lightroom, tap the Share icon. Choose Edit in.. > Healing in Photoshop Fix. Tap Ok. 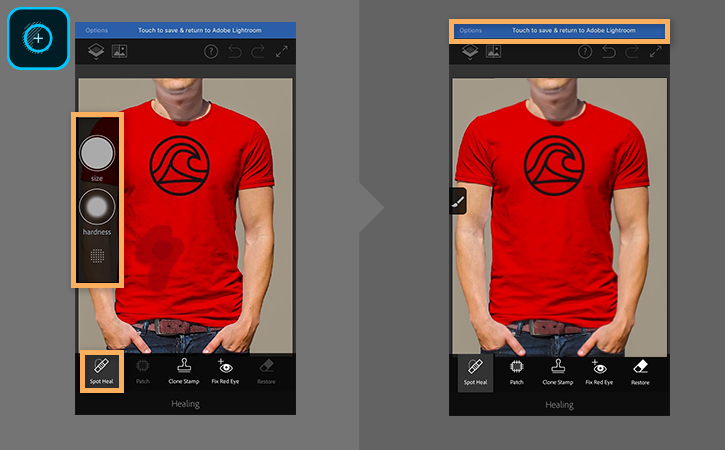 In Photoshop Fix, tap Healing, then Spot Healing. Drag your finger over the stain to remove it from the product image. Tip: You can control how the healing area is selected using the size and hardness controls. 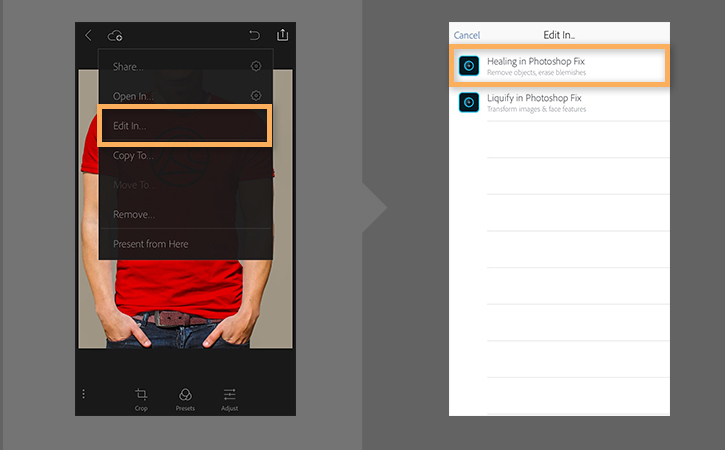 When you're done, tap Touch to save & return to Adobe Lightroom. Lightroom opens showing a new version of your photo. 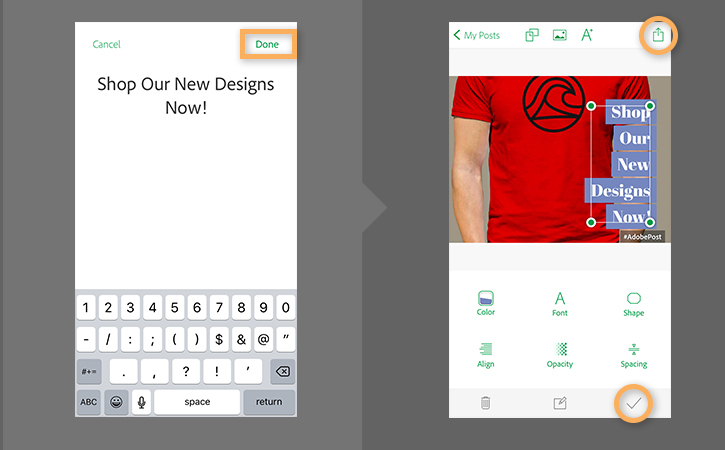 Tap the Share icon and choose Copy to... 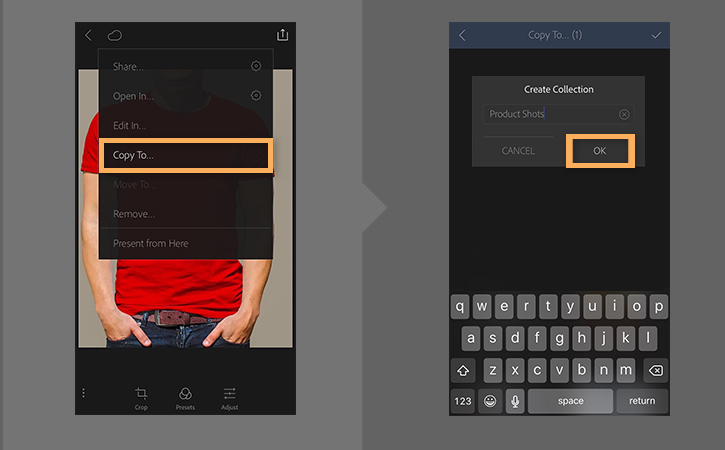 In the collections screen that appears, tap the + to create a new collection. Then, tap the checkmark at the top of the screen. Finally, give your collection a name and tap Ok.
Open Spark Post. Tap the + and choose Lightroom. 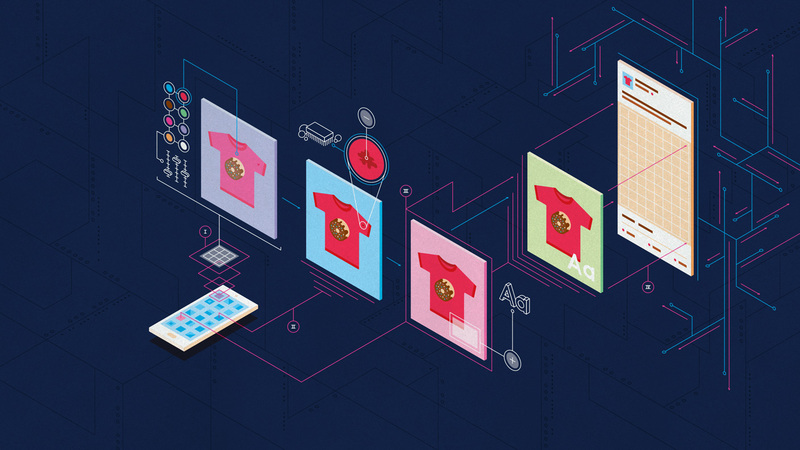 Select the new collection you just created and choose your product photo. Tip: You can also take a photo with your device camera or import a one from your Photo Library to create a new post. Select where you want to publish your ad. Spark Post automatically resizes your post so it works with your destination. In this case, we chose Facebook. Tap Continue when you're done. 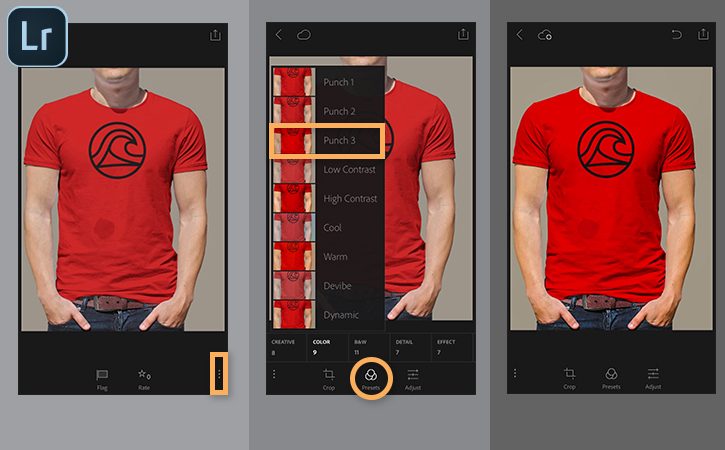 Tap the Design button then select a preset and tap the checkmark to apply it. Spark Post has dozens of preset you can use create professional looking ads in minutes. Double-tap the text and enter your ad copy. When you're finished, tap Done. Now you can drag the text box to position it anywhere on your ad. If you want to resize the text, drag one of the anchors. Now you're ad is ready to share. 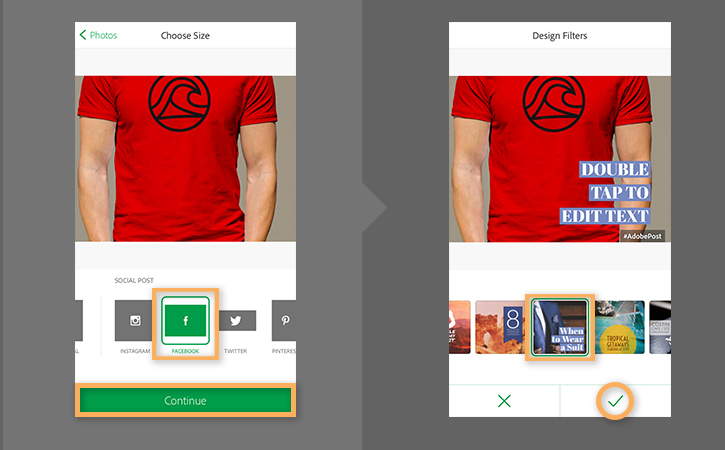 You can tap the Share icon at the top of the screen or upload it to a service like the Facebook Ad Builder. See Facebook blueprint to learn more about creating ads on Facebook.